If you are like me, even with the best of Summer intentions, you are running out of ideas to keep the kids busy by August. Crafts are hit or miss around here with my boys so I have to seize any interest I can find. Right now, we are eagerly anticipating the arrival of Angry Birds Star Wars II so I thought it would be fun to make some light sabers! This was one of those late afternoon (please let us make it til dinner without a meltdown) crafts so I just used whatever I could find in the house. Thankfully, I didn’t need more than some paper, a couple of toilet paper tubes and some pipe cleaners ! I drew a light saber for myself, Calvin, and Oscar. We colored them, cut them out, and put them together! The boys had a blast playing with them and they actually made it to day two (and counting)! 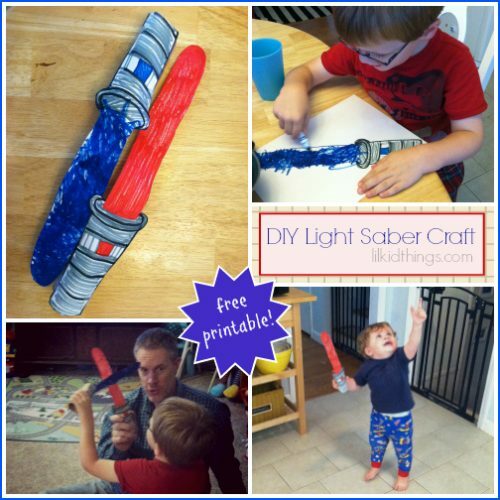 Make your own light saber! If you are looking for an easy craft to make with your kids, I created a free printable for you! 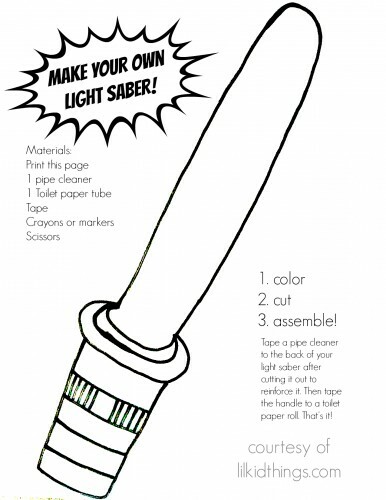 Click the image below or this link for my free printable light saber craft and enjoy! How are you getting through the last days of Summer? Want more? Check out my other Crafts here! Did you make this craft? I’d love to see it! Leave a link in the comments or share your pic to my Crafts. Thanks for reading!